"Online, you get to know your students' minds, not just their faces," reads the tagline to Jeff Ventrano’s e-mail messages. That sums up his attitude toward online learning at Ivy Tech Community College in Indiana, where Ventrano serves as a technical specialist for academic affairs and as Blackboard administrator. Ivy Tech is a large Indianapolis-based community college with 23 campuses across the state, along with some 100,000 students and 8,000 instructors. For the fall 2006 semester, 23,000 Ivy Tech students were enrolled in distance learning courses, a number that has been climbing steadily since distance learning options were introduced at the college five or so years ago. About 66 percent of Ivy Tech students have taken some online instruction, Ventrano says, and just about every course offered is also available online, or as a mix of face to face and online. “It has really taken off,” says Ventrano, who, as a student at Ivy Tech, enjoyed the online courses he took. Given the college’s volume of online instruction, a tool that makes it easier for faculty to manage their online content can only be a good thing. Recognizing that, Ivy Tech is wrapping up beta testing of ClassTop, a new client-side software product that integrates with Blackboard’s learning management system (version 6.3 or higher) to help manage course materials. Using ClassTop, faculty can work offline to create and organize their learning management system (LMS) files and folders, using basic drag-and-drop functions. When the client system—a desktop, laptop, or even flash memory device—is connected to the Blackboard system via the Internet, the instructor’s files and folders are automatically synchronized into the correct areas of the LMS. The software works with either Windows or Macintosh operating systems. ClassTop pays off, Ventrano says, for adjunct instructors who work at home preparing their course content. Some areas of the state still rely on dial-up Internet connections, which can be excruciatingly slow when large files are being exchanged. ClassTop addresses that issue, allowing the instructor to prep files at home, then wait until he or she is on campus, where connections are far faster, to upload new course material. In fact, since ClassTop works from a flash drive as well, the instructor needn’t bring a computer to campus, just a small memory device. ClassTop was introduced, Ventrano says, to try to offer “a quick and easy way for instructors who are teaching multiple sections of one course to upload data into those courses all at one time.” With Blackboard, adding items to multiple courses involves logging on repeatedly to add items to each course. With ClassTop, only one login is required; instructors drag and drop files to place them. The files are synchronized with the LMS all at once at the end of the session. “The time savings are tremendous,” Ventrano says. “If you’re teaching four courses and two sections, it makes it really easy to manage the content,” says Abu Moniruzzaman, director of academic / networking information technology services at Ivy Tech. 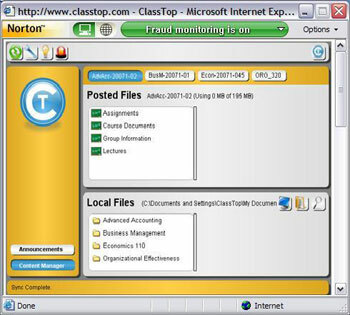 ClassTop was launched in mid-2006 in response to research, the company says, that identified low adoption rates among instructors for online learning. It’s sold under a site-wide license; price is based on the number of instructors at the institution and includes volume discounts.